This Salad with Shredded Brussel Sprouts Recipe is the perfect fall side dish. 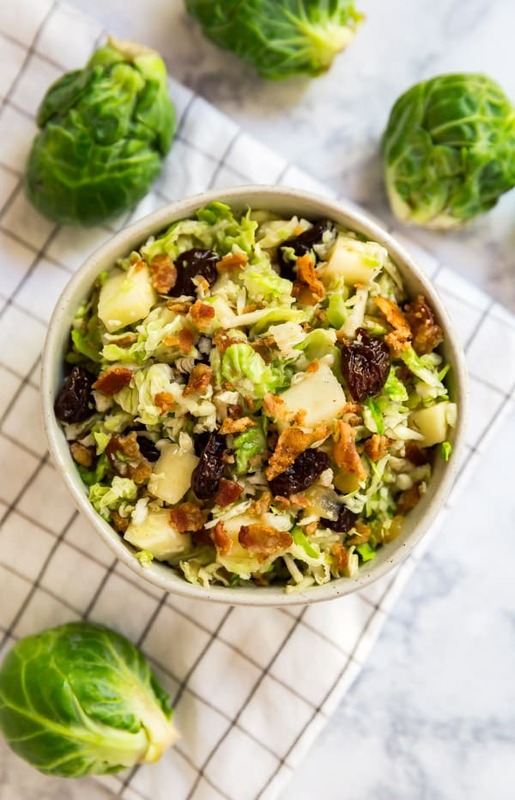 Made with apples and dried cherries and topped with a warm bacon dressing, this is the best way to make even the most avid Brussel Sprouts hater to change their minds! It wasn’t until I was an adult that I really discovered my love for Brussel Sprouts. And it wasn’t until last year that I really discovered my love for Brussels Sprout in the form of a salad. Prior to that I liked roasting them with simple olive oil, salt and pepper until they’re nice and brown on the outside with the most perfectly nutty flavor. And some day I’ll share that method. 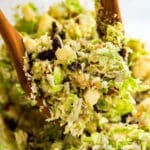 But today, it’s all about this Brussel Sprout salad. This is basically the most light and fresh side dish you’ll come across this fall, and a truly delightful and refreshing addition to your Thanksgiving feast. But more importantly, it’s crazy easy to make and some of it can even be done ahead. Clean the Brussels sprouts well. Cut off the bottoms, remove any dirty and outer leaves and halve any larger ones. Use a food processor to shred the Brussels sprouts. This will make it so much quicker and easier. I use the shredding blade for this. Sprinkle a little lemon juice over the apples to keep them from turning brown. You can make the dressing ahead, just be sure to reheat it and dress the salad just before serving. I don’t encourage you to dress the salad in advance as the bacon grease will solidify and it’s not the most desirable texture. 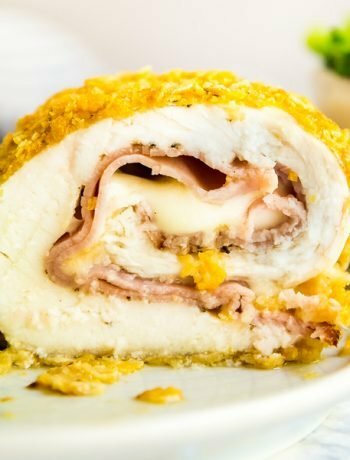 The leftovers still taste fine, but this is much better in the initial serving. If dried cherries aren’t available, dried cranberries or dried currants are an excellent substitute. 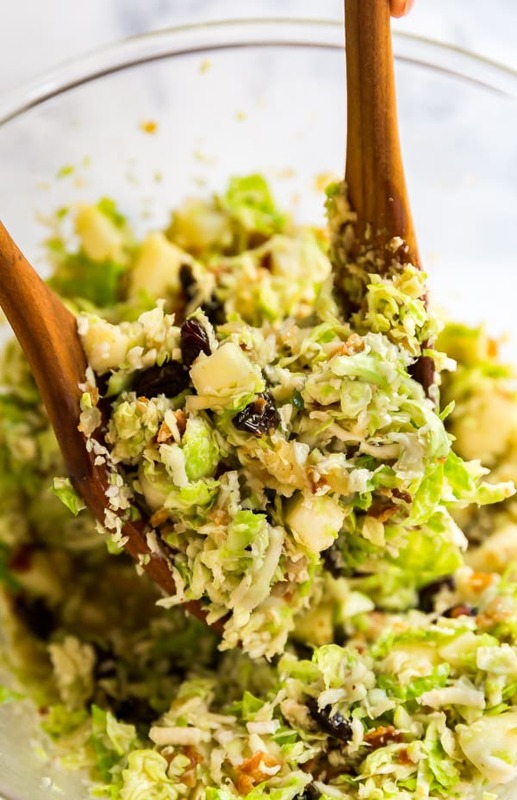 This Salad with Shredded Brussel Sprouts Recipe is the perfect fall side dish. 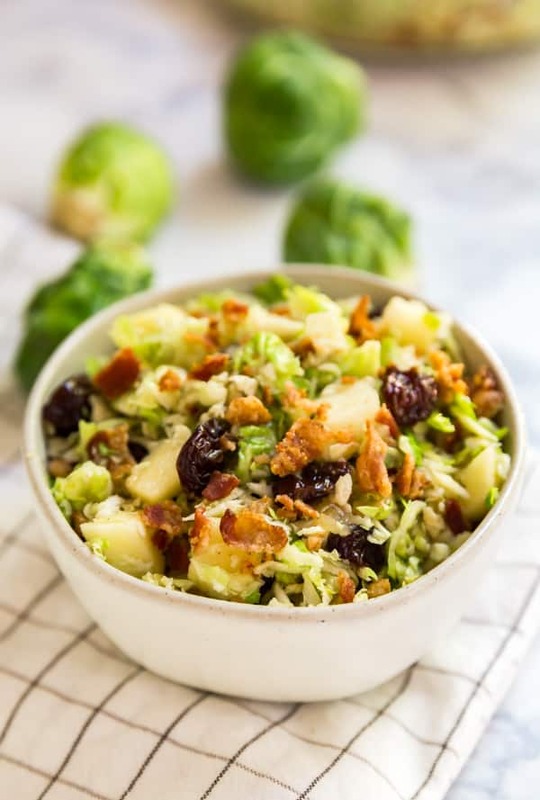 Made with apples and dried cherries and topped with a warm bacon dressing, this is the best way to make even the most avid Brussels Sprouts hater to change their minds! Fry the bacon in batches in a frying pan until crisp, reserving all the bacon grease for later. Remove cooked bacon to a paper towel-lined plate and set aside to cool. While the bacon cooks prepare Brussels sprouts, apples and dried cherries and combine in a large bowl. Crumble all bacon except for 2 slices into the bowl as well. Set aside. Add all bacon grease back into the pan along with the onions and saute stirring frequently until soft, about 5-7 minutes. 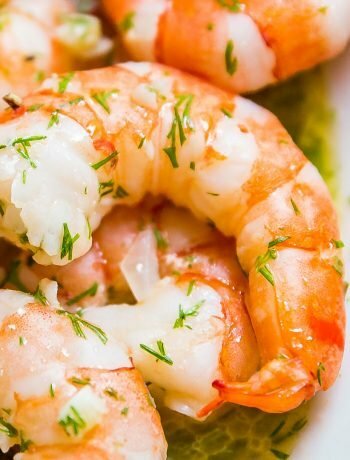 Stir in vinegar, water, and sugar and simmer for 2-3 minutes to dissolve the sugar. Pour this dressing over the salad and toss to coat. Crumble remaining two pieces of bacon over the top and serve immediately. I used Gala apples but if you're looking for a more tart variety, Granny Smith is also a great option.